Who would have ever thought that tiny red spots on Dawson’s skin would change our lives forever? A simple blood test ordered by our pediatrician led to a phone call on the night of November 17th 2014, informing us that the results from Dawson’s blood work were not normal, and the doctors at Helen Devos Children’s Hospital emergency room were waiting for us. 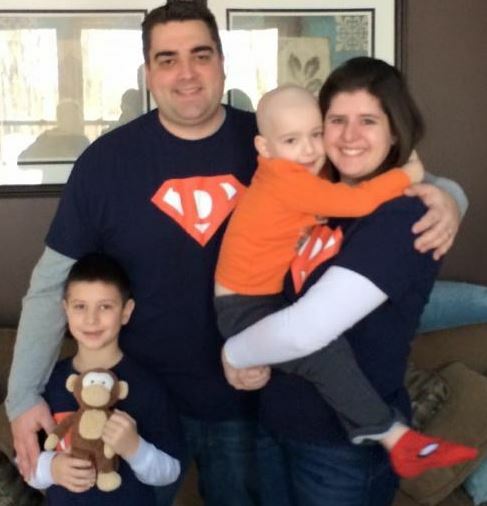 When we arrived, we were hit with the unimaginable news that our 4 year old son had Leukemia. He was admitted to the hospital immediately where they performed a biopsy and began chemotherapy. After many days in the hospital with multiple blood transfusions, chemo and various procedures Dawson was discharged. One week after being discharged, Dawson unexpectedly developed a fever which is life threatening for an immune suppressed Leukemia patient. We ended up at the emergency room again and this time, Dawson had an infection in his blood and no way to fight it off. During his three week stay he was on a variety of antibiotics to fight the infection and he continued to receive his chemo. The bone marrow biopsy at the end of the first month of treatment revealed that the chemotherapy was killing the Leukemia but his body was responding much slower than the average cancer patient. This ultimately elevated Dawson to be placed in a category of very high risk for relapse and on a course of chemo treatment more intense than the standard Leukemia patient. We were able to return home just in time for the holidays. Dawson remained home for two months, only leaving the house to attend his weekly chemotherapy appointments at the hospital due to his suppressed immune system. The chemotherapy was doing its job by completely wiping out Dawson’s bone marrow, but once again made him very susceptible for another infection which happened near the end of February keeping Dawson in the hospital for another two weeks for antibiotics. Dawson continues to receive weekly chemotherapy and occasional blood transfusions in the outpatient infusion clinic and will continue aggressive chemotherapy for the next nine months. Then he will enter the maintenance phase of therapy where he will have monthly chemotherapy appointments for an additional two and half years. We hope and pray that there are no complications throughout the next 3 years of Dawson’s treatment. We will work with local businesses allowing them to sponsor the birthday as well as allow their employees to engage in the community by coming together to get gifts for the children. Utilizing a process similar to a Potluck dinner or Wedding registry, all of the child’s info will be provided to the company including their wish list, interests, sizes, wants, and needs (obtained from the parent). MSL will provide a Bible, backpack, sleeping bag, blanket, balloons and a cake to accompany the gifts from the employees. The items below are straight from the birthday wish list of Dawson. Our goal as always is to exceed expectation and bless all those involved. We have made it easy so you can help with any or all gifts with as little as a $5 contribution. Simply check the gift categories that you would like to help out with, close one out on your own, get a friend to go on with you, etc. and run your card at check-out. All gifts are tax deductible also. If you would prefer to go and buy the gift yourself, please call us at 616-613-MORE and we will manually adjust the site. We need all gifts wrapped and in our office on May 11. thank you all!